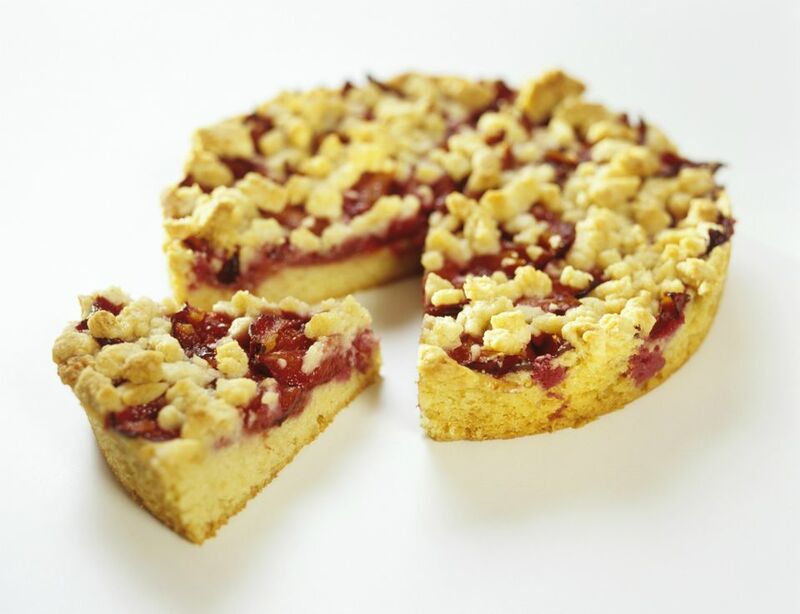 This easy German streusel cake (streuselkuchen) with fruit filling is the closest German cooks get to a pie. While the concept is similar, slant-sided pies are an American tradition which came straight from the British. Here, the streusel crust is much richer than pie dough and is pressed into a springform pan, keeping to a true cake form. Use any fruit, especially stone fruit, thickened with cornstarch (Germans would use potato starch) or even tapioca, for the filling if you like. Wash and pit fresh cherries to make about 1 1/2 cups (about 1 pound) and save any juice that comes off the fruit. If you are using canned cherries, drain, reserving juice, and set aside. You may use sweet or sour cherries (or combine them). Measure juice from cherries and add water or juice to make 1 1/2 cups. Prepare pudding according to the directions, but with juice, NOT milk. ​If you do not have pudding mix, combine 3 tablespoons of cornstarch, 4 tablespoons of sugar and some vanilla extract and cook into a pudding. After pudding thickens, stir in cherries and cook for one minute. Remove from heat and set aside while you prepare the streusel. In a large bowl, mix together the flour, sugar, vanilla sugar, salt, and baking powder. Add cold butter chunks and the eggs. Mix by either rubbing the ingredients together with your hands as for pie dough or use a mixer on low speed until crumbs form. Assemble the streusel cake: Press 2/3 of the crumbs into the bottom and 1 inch up the sides of a buttered, 9-inch springform pan. Make sure the dough is packed and no holes are visible. ​​If you do not have a springform pan, use a 9-inch deep-dish pie pan or maybe 2 (8-inch) pie pans. Pour the fruit on top of the unbaked crust. Do not fill above your crust, even if you have filling left over. Using the rest of the dough, crumble streusel over the top. Bake at 350 F for 45 to 55 minutes. Cool completely before serving or the filling will be runny. You can sprinkle a little confectioners' sugar over the top for a nice presentation. Serve with whipped cream or ice cream. Do You Know How a Streusel Differs from a Crumb Topping? How Do You Make Aprikosenkuchen, a Classic German Apricot Cake?